The successful management of venous leg ulcers represents a significant clinical problem and a major drain on limited financial resources. Research has shown that the majority of ulcers can be induced to heal by the application of adequate levels of sustained graduated compression although this technique is contra-indicated for the treatment of ischaemic ulcers. Bandages vary greatly in their ability to provide sustained compression due to differences in their structure and the content of elastomeric yarns. Other factors, such as limb circumference and shape, will also have an important influence on the pressure produced beneath a compression bandage. This article describes a classification system in which bandages are grouped according to their function and performance, in order to facilitate the choice of an appropriate product. Brief guidelines are also provided on the differential diagnosis of venous leg ulcers. Leg ulcers are a chronic condition, the treatment of which has been estimated to cost the United Kingdom's National Health Service (NHS) between £300 and £600m per annum. Leg ulcers can be caused by a number of physiological or biochemical disorders, either individually or in combination, but the majority, approximately 70%, are associated with venous disease. The prevelance of active venous ulcers in the the United Kingdom is around 1.5/10000 of the adult population, although the number of people who develop at least one episode of ulceration may be three to four times greater than this. The prevelance of venous ulceration increases with age and the condition is also more common in women than men. A significant number of ulcers (about 20%), are caused by some form of arterial disease. Depending upon the location and severity of the problem, this may affect large parts of the leg or smaller localised areas of tissue. A rapid onset of ischaemia may be due to an embolism but a more gradual reduction in blood flow can be caused by progressive occlusion of the vessels by the deposition of fatty substances on the internal walls leading to the formation of atheromatous plaques. As this is a time related process, the prevelance of ischaemic or arterial ulcers rises with increasing age. Other important causes of ulceration include diabetes and rheumatoid disease, although numerous other medical conditions can also lead to ulcer formation. Ulcers which are caused by arterial disease should be referred to a specialist vascular surgeon for assessment and possible surgery. Venous ulcers, however, can be managed by more conservative means, although surgery may subsequently be considered to correct the underlying physiological disorder. The epidemiology of leg ulcers has been comprehensively reviewed by Fletcher. The veins of the leg are divided into the superficial and deep systems according to their position relative to the fascia. The deep veins, which come together to form the popliteal and femoral veins lie within the fascia and are responsible for the venous return from the leg muscles. Also within the facia in the soleus and gastrocnemius muscles are located dilated valveless sinusoids, which fill with blood when the leg is at rest. Together these deep vascular structures have a combined volume of about 100-140 ml - comparable with that of one of the ventricles of the heart. The long saphenous vein which runs along the medial side of the leg from foot to groin and the short saphenous vein which runs at the back of the calf from foot to knee are the major vessels of the superficial venous system. These vessels lie outside the fascia and are responsible for the venous return from the skin and subcutaneous fat. The two systems are joined by communicating veins, sometimes called perforators as they perforate the deep fascia. The perforators, like the other veins in the leg, contain valves that permit the flow of blood in one direction only, from the outer or superficial system inwards to the deep veins. The venous pressure at the ankle of a subject who is lying supine is around 10 mmHg, but on standing this will rise by about 80 mmHg, due to an increase in hydrostatic pressure (equivalent to the weight of a vertical column of blood stretching from the point of measurement to the right auricle of the heart). During walking, as the foot is dorsal flexed, the contraction of the calf muscle compresses the deep veins and soleal sinuses to the point at which they become almost totally collapsed, producing internal pressures of up to 250 mmHg and emptying them of blood. As the foot is plantar flexed, the pressure in the veins falls, the proximal valves close, and the veins are refilled by blood passing through the perforators from the superficial system. During this cycle, in a normal leg, the distal valves of the deep veins and the valves of the perforators will ensure that the expelled blood can go in only one direction - upwards, back to the heart. This 'pumping' action of the calf muscle causes the hydrostatic venous pressure in the ankle region to gradually fall until it reaches a steady state, usually about 30 mmHg in the deep veins and 40 mmHg in the superficial veins. If the subject then stands still, the pressure in both systems will slowly return to a stable value of about 90 mmHg, a process that usually takes about 20-30 seconds. Blockage or damage to the venous system will cause disruption to normal blood flow, which may manifest itself in a number of different ways according to the site and extent of the damage. If the valves in the superficial system are affected, venous return will be impaired and blood may accumulate in the veins causing them to become distended, leading to the formation of varicosities (varicose veins). If the function of the perforator valves is impaired, the action of the calf muscle pump will tend to cause blood to flow in the reverse direction into the superficial system increasing the possibility of damage to the superficial vessels. Following a deep vein thrombosis that results in complete or partial obstruction of a deep vein, the unrelieved pressure produced by the calf muscle pump on the perforator valves may cause these to become incompetent. In this occurs, there will be a large rise in the pressure in the superficial system, which may force proteins and red cells out of the capillaries and into the surrounding tissue. Here, the red cells break down releasing a red pigment which causes staining of the skin - an early indicator of possible ulcer formation. Before commencing treatment of an ulcer, it is essential that the cause is correctly diagnosed; the inappropriate application of high levels of pressure to an ischaemic limb may have potentially catastrophic consequences. Venous leg ulcers tend to occur primarily in the gaiter area and are generally shallow and red in colour. The skin surrounding the ulcer is frequently discoloured due to the staining described previously. Incompetent perforating vein valves can also cause malleolar venules to become dilated and appear as fine red threads around the ankle. This condition, called ankle flair, is also diagnostic of venous ulceration. In contrast, arterial ulcers are generally pale in colour and are frequently covered with slough or necrotic tissue. They tend to be deeper than venous ulcers and commonly have a 'punched-out' appearance. The skin surrounding the ulcer, although generally free of the staining associated with venous disease, is often shiny and hairless. Diabetic ulcers commonly occur on the feet and may result from damage initially caused by pressure from ill-fitting shoes particularly in situations where their sensory perception is impaired due to neuropathy. Useful information on the possible cause of an ulcer may be obtained by asking the patient to describe the pain associated with their wound. Venous ulcer pain is generally relieved by elevating the legs but patients with ischaemic ulcers frequently complain that pain increases on elevation and report that they can only find relief by dangling their legs over the edge of a bed or chair. Although all of these signs provide an indication of the underlying aetiology, this should be confirmed by means of a doppler assessment, to exclude the possibility that an ulcer which appears venous in origin has a significant arterial component. In this technique, the use of which has been described in detail by Vowden et al. both the brachial and ankle systolic pressure are determined in the normal way using a hand held doppler probe to detect blood flow at the brachial pulse and the dorsalis pedis pulse on the dorsum of the foot. The measured ankle pressure is divided by the brachial pressure to obtain the Ankle Brachial Pressure Index (ABPI), sometimes called the resting pressure index. Figure 3 - Using a doppler to measure blood flow at the dorsalis pedis. In the absence of arterial disease, systolic pressure in the leg should equal or exceed that in the arm producing an ABPI of at least 1. If arterial disease is present, the index will be below 1. An index of about 0.8 or below is generally considered indicative of significant arterial disease. In these situations compression therapy is contraindicated. Occasionally ABPI values as low as 0.4 are encountered. Such patients should be referred for urgent specialist vascular assessment. In the presence of severe atherosclerosis, it is possible for the walls of the affected vessels to become so calcified that they cannot be compressed with a sphygmanometer cuff. This will lead to an incorrect blood pressure reading and therefore a misleading or artificially high ABPI. Normal ABPI values may be obtained with patients with diabetes but compression therapy should be used with caution in these individuals because of the possibility of microvascular disease. For patients with venous disease, the application of graduated external compression can help to minimise or reverse the skin and vascular changes described previously, by forcing fluid from the interstitial spaces back into the vascular and lymphatic compartments. As the pressure within the veins of a standing subject is largely hydrostatic, it follows that the level of external pressure which is necessary to counteract this effect will reduce progressively up the leg, as the hydrostatic head is effectively reduced. For this reason it is usual to ensure that external compression is applied in a graduated fashion, with the highest pressure at the ankle. The optimal value for the degree of pressure required remains a matter of some debate. In practice, the optimum pressure will probably vary according to a number of factors, including the severity of the condition and the height and limb size of the patient. Medical hosiery represents a useful and convenient method of applying graduated compression to normal shaped legs in order to prevent the development or recurrence of leg ulcers. However, these stockings are of limited value in the treatment of active ulceration, being difficult to apply over dressings. In such situations compression bandages currently represent the treatment of choice. Bandages have a history stretching back thousands of years to the time of the ancient Egyptians, who used simple woven fabrics, often coated with adhesives, resins and other medicaments as dressings to aid wound healing. Like some of the bandages used today, these were made from non-extensible fabric and probably required considerable skill on the part of the user to ensure correct application. In the 17th century, Pierre Dionis who was Surgeon-in-Ordinary to the queen of France and to the Empress Maria Theresa of Austria, recommended the use of rigid lace-up stockings made from coarse linen or dog skin to apply compression in the treatment of leg ulcers: the bandages available at that time were not suitable for the application of sustained, controlled compression because of their inelastic nature. It was not until the middle of the 19th century that the first elasticated bandages, containing natural rubber, were manufactured. In 1878, Callender published a letter in the Lancet which described the use of these materials in the management of varicose veins. In the United Kingdom, standards for bandages first appeared in a supplement to the 1911 British Pharmaceutical Codex (BPC). The Codex included a specification for an extensible Crepe bandage (containing cotton and wool yarns), as well as monographs for simple non-extensible products such as calico, flannel, domette and open wove bandages. These bandages had a simple retention function, although they also provided warmth and protection. As new products were developed, additional monographs were introduced, but when publication of the Codex ceased, many of these standards were transferred into the British Pharmacopoeia. Despite differences in the structure and composition of these early bandages, the majority were produced from natural fibres by a weaving process and in this respect they were essentially similar to the linen materials used by the ancient Egyptians thousands of years earlier. The pressure developed beneath any bandage is governed by the tension in the fabric, the radius of curvature of the limb and the number of layers applied. Applying a bandage with a 50% overlap produces two layers of fabric, which generates a pressure twice that produced by a single layer. Sub-bandage pressure is therefore directly proportional to bandage tension but inversely proportional to the radius of curvature of the limb to which it is applied. This means, therefore, that a bandage applied with constant tension to a limb of normal proportions will automatically produce graduated compression with the highest pressure at the ankle. This pressure will gradually reduce up the leg as the circumference increases. Most legs, however, are not circular in cross section. Consequently, the pressure applied by a bandage will vary significantly around the circumference at any given point on the leg. Particularly marked variations in pressure will be found over bony prominences such as the malleolus (ankle bone) and tibial crest (shin). For this reason, it is recommended that prior to the application of a compression bandage, adequate padding should be applied to the leg to prevent localised areas of excessively high pressure. This padding should not simply be wrapped around the leg but applied in strips around or along side bony or protruding areas. The aim should be to impart to the leg a circular cross-sectional profile in order to achieve consistent levels of compression. Care should be taken also to ensure that bandages do no slip or become displaced as this will lead to multiple layers forming, which in turn may lead to localised areas of high pressure. Although bandage tension, and hence sub-bandage pressure, is initially determined by the user during application, the ability of a bandage to maintain this tension, under normal conditions of use, is subsequently determined by its elastomeric properties. 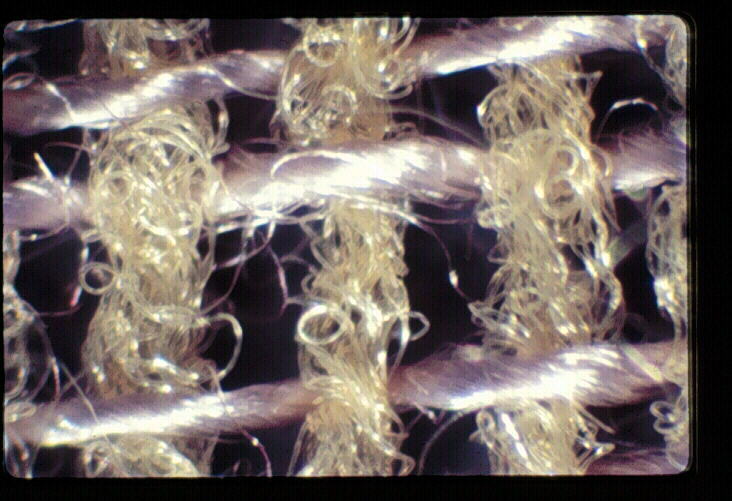 The elastic properties of simple woven cotton bandages tend to be extremely poor. Raj et al.,  found that cotton bandages had to be re-applied every 6-8 hours if they were to achieve and maintain therapeutically active levels of pressure, and Tennant et al., showed that over a four-hour period, the pressure recorded beneath a crepe-type bandage fell by some 63%. This compared with a 10% drop beneath a bandage containing significant quantities of elastomer. In recent years, however, completely new products have been developed containing synthetic yarns made of polyamide and polyurethane, many of which are knitted rather than woven. These offer considerable advantages over their predecessors, being more conformable (and thus easier to apply) as well as more elastic due to the use of new elastomeric yarns. 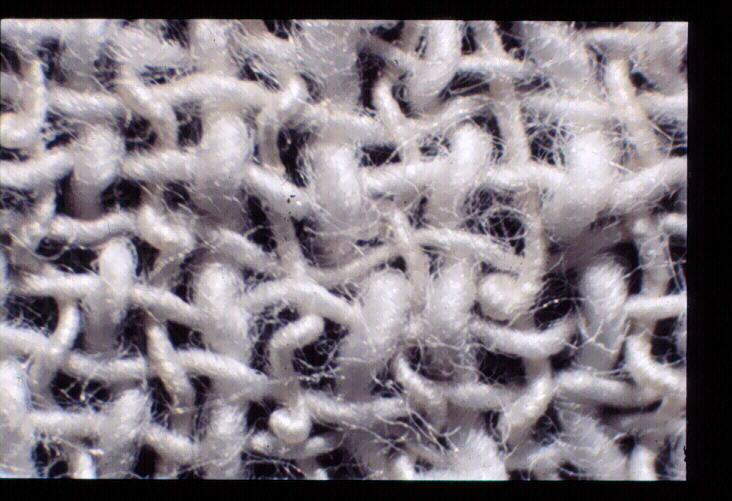 Figure 7 - A knitted bandage containing viscose and nylon. By selecting the appropriate yarns, the 'power' or strength of a bandage may be finely controlled and thus, for the first time, it has become possible to design an extensible bandage which will perform in a predetermined fashion in order to meet a specific clinical need. Barbenel et al.,  compared the compression profiles produced by five different extensible bandages over a 1 hour period, with particular reference to the bandage type and the application technique. They showed that according to the product applied, the calf pressure 30 minutes after application varied from 11 mmHg to 34 mmHg. In all cases, bandages applied in a figure of eight configuration resulted in pressures that were approximately 1.5 - 2 times those produced when the same bandages were applied in the form of a spiral with a 50% overlap. Sockalingham et al.,  used a specially designed pressure monitoring system which consisted of a goniometer to detect the position of the lower leg (flexed or extended) and a sensor to measure sub-bandage pressure. Using this equipment, they were able to demonstrate differences between different types of bandages and also illustrate the effect of posture on sub-bandage pressure. During their investigations, both Barbenel and Sockalingham showed that the pressure produced by a short-stretch bandage, Elastocrepe, was only one third of that produced by a more elastomeric product. The relative performance of three different bandaging systems was investigated by Callam et al.,  who compared the effect of time and posture on the pressure profiles produced by an elastic bandage (Tensopress), with a minimal-stretch bandage (Elastocrepe) and a non-elastic compression device consisting of concentric horizontal velcro bands (Circaid) With a standing subject, all three regimens produced graduated compression for the duration of the study but although the pressure beneath the elastic bandage remained relatively constant, the pressure beneath the non-elastic and minimal stretch regimen fell by about one third after four hours. In the horizontal position, the minimal stretch regimen also showed a loss or a reversal of graduation and the authors concluded that if this reduction in pressure were to continue, a question mark must be placed on the efficacy of the bandaging system. gives an indication of the degree of extension required to produce a predetermined level of compression. determines the change in bandage tension (and hence sub-bandage pressure) that will occur as a result of small changes in limb circumference when the bandage is applied at the recommended extension. provides assurance that when applied correctly, pressures greatly in excess of the target levels will not develop beneath the bandage in normal use. Using the test method, bandages may be classified into three distinct groups which have fairly precise clinical indications. They are retention, light support, and the provision of varying degrees of compression. Other specialised products may not fit into this classification and these should be considered separately. Lightweight conforming-stretch bandages, are products which have a simple dressing retention function. These bandages should conform well to a limb or joint, without restricting movement. The ideal retention bandage should have a long shallow extensibility curve so that small changes in limb circumference will not significantly increase sub-bandage pressure which in any event should not normally exceed a few millimetres of mercury. Type 1 bandages frequently contain lightweight elastomeric threads which impart a high degree of elasticity but little power to the bandage. Examples include Slinky, Stayform and J-Fast. Light support bandages: products in this group are also sometimes called short or minimal stretch bandages. They include the familiar crepe-type products of the British Pharmacopoeia together with numerous 'non-official' variations of these bandages, which are manufactured from cotton or cotton and viscose, and which show considerable variability in performance. They are used to prevent the formation of oedema and give support in the management of mild sprains and strains. Compared with the compression bandages described below, light support or minimal stretch bandages have limited extensibility and elasticity, and tend to 'lock out' at relatively low levels of extension. It is this feature that enables them to be applied firmly over a joint to give support without generating significant levels of pressure. 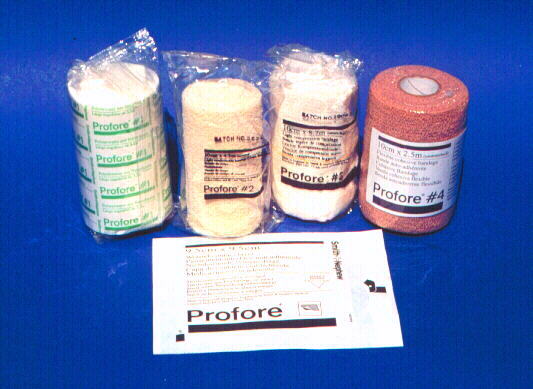 Short stretch bandages have also been used for the treatment of venous leg ulcers. When applied at full extension, they form an inelastic covering to the leg which tends to resist any change in the geometry of the calf muscle during exercise, thereby increasing surface pressure in a cyclical fashion and enhancing the action of the calf muscle pump. Similarly, when an individual moves from a supine to a standing position or sits with the legs dependent, blood collects in the vessels and sinuses of the lower leg under the influence of gravity, causing the volume of the leg to increase. If this is associated with the formation of oedema, leg volume will increase still further. A short stretch bandage applied at full stretch, with the legs elevated, will tend to resist a change in volume as the legs are placed in a dependent position. This restriction will result in a significant rise in sub-bandage pressure, the degree of which will be determined by whether the subject is sitting or standing. If the subject then reverts to a supine position, the effects of gravity are reduced, the leg volume decreases and the sub-bandage pressure falls. For this reason short stretch bandages produce low residual or resting pressures. Because short stretch bandages have limited elasticity, they are likely to be less effective than high compression bandages at reducing existing oedema as they lack the ability to 'follow in' as a limb reduces in circumference. They may, however, offer some advantages in the treatment of venous ulcers where a degree of arterial impairment is known or suspected as the low residual pressures will be less likely to compromise arterial inflow. Examples of Type 2 light support bandages (including short stretch bandages) include Elastocrepe, Leukocrepe, Lenkelast and Comprilan. Compression implies the deliberate application of pressure and is most commonly employed to control oedema and reduce swelling in the treatment of venous disorders of the lower limb. Within the classification system, compression bandages have been divided into four groups according to their ability to produce predetermined levels of compression. Type 3a: Light compression bandages such as K-Plus - Parema, and Tensolastic, are able to provide and maintain low levels of pressure, up to 20 mmHg on an ankle of average dimensions. The clinical indications for products of this type include the management of superficial or early varices, and varicosis formed during pregnancy. In general, they are not suitable for controlling or reducing existing oedema, or for applying even low levels of pressure to very large limbs. Type 3b: Moderate compression bandages may be used to apply compression in the order of 30 mmHg on an ankle of average dimensions. They are indicated for the treatment of varicosis during pregnancy, varices of medium severity, the prevention and treatment of ulcers and the control of mild oedema. Type 3c: High compression bandages may be used to apply high levels of compression in the order of 40 mmHg on an ankle of average dimensions. Indications for these bandages include the treatment of gross varices, post-thrombotic venous insufficiency, and the management of leg ulcers and gross oedema in limbs of average circumference. Products in this category are not necessarily able to achieve these levels of pressure on very large limbs that have been further enlarged by the presence of oedema. Examples include Tensopress, Setopress and Surepress. 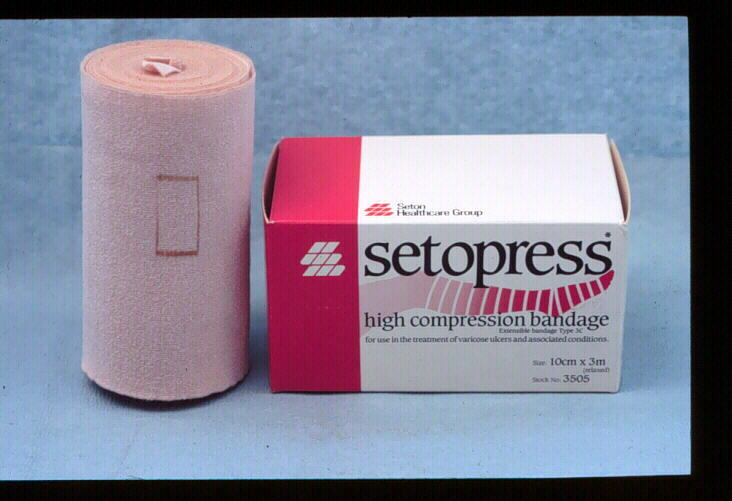 Type 3d: Extra-high performance compression bandages are capable of applying pressures in excess of 50 mmHg. The power in the bandages is such that they can be expected to apply and sustain these pressures on even the largest and most oedematous limbs for extended periods of time. This group includes Elastic Web Bandage BP (Blue Line Webbing) and Varico Bandage. Sub-bandage pressure: effect of application technique. In order to achieve the pressures described in the classification system described above, it is assumed that the bandages in question will be applied in the form of a spiral with a 50% overlap between turns, effectively producing a double layer at any point on the limb. Different application techniques such as a figure of eight bandage will produce larger numbers of layers at any one point and therefore higher sub-bandage pressures. Figure 8 - Effect of ankle circumference upon sub-bandage pressure. In an attempt to overcome this problem, bandages have been produced which have a geometrical design printed at intervals along their length which changes shape when the bandage is stretched to a predetermined level of tension. One product, Setopress, has two series of rectangles. One series is coloured green, the other brown. When the bandage is stretched, the green rectangles become squares at about 70% extension. The brown rectangles become squares when the bandage is stretched to 100% extension. Using these application aids it is possible to apply the bandage to achieve predetermined levels of pressure on limbs of different sizes as described in a table supplied by the manufacturer (Table 2). 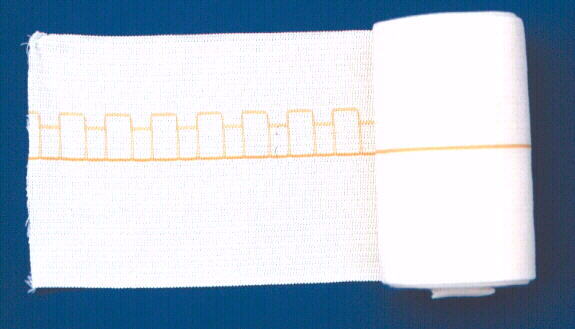 A second product, Surepress, has a series of rectangles of two different sizes knitted into the structure along the midline of the bandage. These rectangles are designed to allow the bandage to achieve a target pressure of 40 mmHg to legs of different sizes. The importance of sustained compression in the treatment of chronic venous ulcers was demonstrated by Backhouse et al.,  who described a trial in which they compared an occlusive dressing (Granuflex) with a simple fabric dressing (N-A) in the treatment of fifty-six patients with chronic venous ulcers. A standard bandaging technique was used for both groups of patients, as follows. A layer of orthopaedic wadding (Velband) was applied over the primary dressing, to act as an absorbent layer and distribute the pressure from the bandages that were applied subsequently. A layer of crepe bandage was used to compress the Velband, and this was followed by a layer of Elset bandage and a final layer of a cohesive bandage (Coban). The pressure under these bandages was measured at four points between the medial malleolus and the knee in 16 volunteers. In each case, a gradual fall in pressure was recorded - from 42 mmHg at the ankle to 17 mmHg just below the knee. As the healing rates in the two groups of patients were not significantly different, the authors stated that there was little benefit to be gained from the use of the occlusive dressing and concluded that `careful graduated compression bandaging achieves healing even in the majority of so-called resistant chronic venous ulcers'. 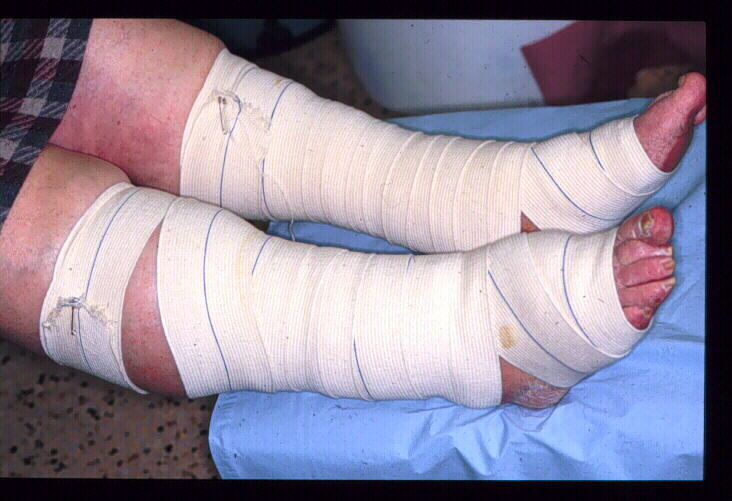 This Four Layer Bandaging technique has become regarded by many as the treatment of choice for venous leg ulcers although subsequent studies have failed to reproduce the early successes reported by Blair et al. Since it was first described, changes have been made to the components used within the four layer system and a commercial presentation containing the various elements has also been introduced. Figure 12 - The components of the Profore system. Graduated external compression plays a major role in the successful treatment of venous ulcers. Several different types of bandaging systems are available, each of which may have advantages over the others for particular applications. The enhanced performance of some of the new bandages means that if they were to be applied with excessive tension, unlike the older cotton based products, they will maintain these levels for extended periods with potentially disastrous consequences for the patient. A sound grasp of the theory of bandaging and a good application technique are therefore essential if these new bandages are to be used safely and cost effectively. To this end, bandaging and advice on product selection, should once again form a part of a nurse's training. The importance of good bandaging technique was described in 600 BC by Sushruta who suggested that practitioners should practice on life sized mannikins made of stuffed linen. If such mannikins could be produced with multiple pressure sensors in the legs to monitor bandage performance, they could provide a useful method for assessing the performance of both bandage and bandager! In order to understand the science of bandaging, it is first necessary to become familiar with the following terms and definitions. The extensibility of a bandage, determines the change in length that is produced when the bandage is subjected to an extending force. Extensibility is usually expressed in the form of a percentage which relates the stretched to the unstretched length. It may be measured using a constant rate of traverse machine such as an Instron, which extends the bandage at a predetermined rate whilst recording the tension developed within it. If the construction of the bandage is such that when it is stretched past a given point the textile components prevent further extension, even though the elastomeric fibres may not have reached the limit of their elasticity, lock out is said to have occurred. Power or modulus determines the force that is required to bring about a specified increase in bandage length. The greater the power, the larger the force that is required. Elasticity determines the ability of bandage subjected to an extending force in the manner described above, to resist any change in length and return to its original length once the applied force has been removed. Compression implies the deliberate application of pressure in order to produce a desired clinical effect. It is usually achieved by the use of elasticated stockings or an appropriate bandage, and is most commonly used to control oedema and reduce swelling in the treatment of venous disorders of the leg. Support may be defined as the retention and control of tissue without the application of compression, and is usually provided to prevent the development of a deformity or a change in shape of a tissue mass due to swelling or sagging. Although non extensible bandages can be used for this purpose, a product with a limited degree of extensibility is generally preferred as it is easier to apply. Conformability of a bandage determines its ability to follow the contours of a limb and is governed largely by the density and extensibility of the fabric, the more open and extensible the structure, the more conformable the product is likely to be. 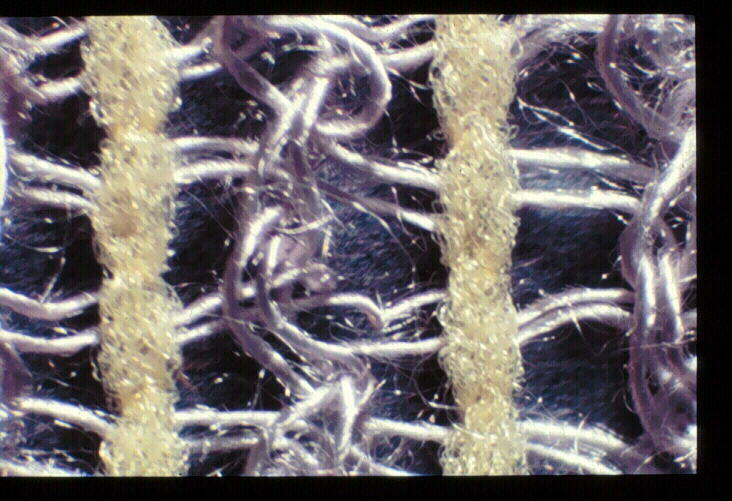 As a general rule, knitted bandages tend to be more comfortable than woven ones. Moffat C., The organisation and delivery of leg ulcer care. In Leg Ulcers, Nursing Management, A Research-based Guide, Cullum N., and Roe B (eds) 1995, Scutari Press, Middlesex. Fletcher A., The epidemiology of leg ulcers. In Leg Ulcers, Nursing Management, A Research-based Guide, Cullum N., and Roe B (eds) 1995, Scutari Press, Middlesex. Negus D., Leg Ulcers; A Practical Approach to Management, 1991, Butterworth Heinmann Ltd, Oxford. 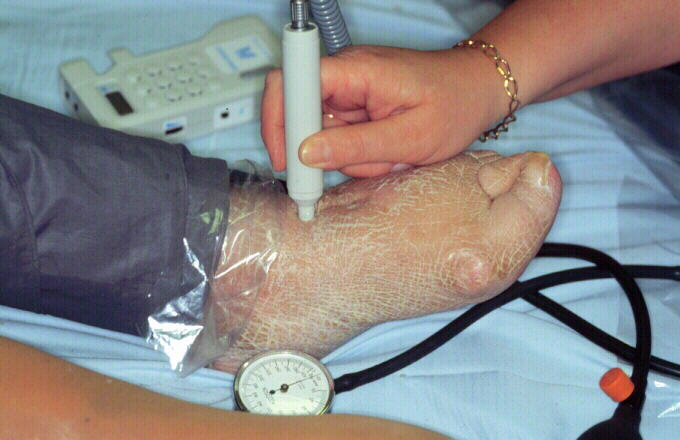 Vowden K.R., Goulding V., Vowden P., Hand-held doppler assessment for peripheral arterial disease. Journal of Wound Care, 1996, 5(3), 125-128 . Gibson B., The nursing assessment of patients with leg ulcers. In Leg Ulcers, Nursing Management, A Research-based Guide, Cullum N., and Roe B (eds) 1995, Scutari Press, Middlesex. Nelson E.A., Ruckley C.V., Dale J., et al., The management of leg ulcers. Journal of Wound Care, 1996, 5(2), 73-76. Thomas S., (Ed. ), Performance profiles of extensible bandages. Phlebology 85, 1986, 667-670 Proceedings of a Symposium, Union Internationale de Phlebologie,, 16-20 September 1985, John Libbey, London. Tennant W.G., et al., Testing compression bandages. Phlebology, 1988, 3, 55-61. Barbenel J.C., Sockalingham S., Queen D., In vivo and laboratory evaluation of elastic bandages. Care Science and Practice, 1990, 8(2), 72-74. Sockalingham S., Barbenel J.C., Queen D., Ambulatory monitoring of the pressures beneath compression bandages. Care Science and Practice, 1990, 8(2), 75-79. Callam A.B., Haiart D., Farouk M., et al., Effect of time and posture on pressure profiles obtained by three different types of compression. Phlebology, 1991, 6, 79-84. British Standard 7505:Elastic properties of extensible bandages. Callam M.J., Ruckely C.V., et al., Hazards of compression treatment of the leg: an estimate from Scottish surgeons.ibid, 1987, 295, 1382. Logan R.A., Thomas S., et al., "A comparison of sub-bandage pressures produced by experienced and inexperienced bandagers. Journal of Wound Care, 1992, 1(3), 23-26. Thomas S., High compression bandages. Journal of Wound Care, 1996, 5(1), 40-43. Burnand K.G., Layer G.T., Graduated elastic stockings. Br. Med J., 1986, 293, 224-225. Moffat C.J., Compression bandaging - the state of the art, Journal of Wound Care, 1992, 1(1), 45-50. Nelson A., Compression bandaging in the treatment of venous leg ulcers. Journal of Wound Care, 1992, 5(9), 415-418. Fletcher A., et al., A systematic review of compression therapy for venous leg ulcers. BMJ, 1997, 315-.